“Land ho!” went the shout on the bridge when the first craggy peaks of Elephant Island materialized among the clouds in the hazy distance. The island is perhaps even more dramatic than South Georgia with serrated ridges covered to the vertical edges in glacier ice, and precious few spots where even a tiny boat could land. 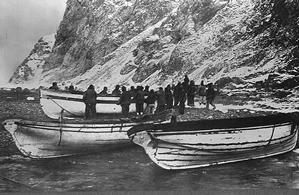 A hundred years ago the glaciers reached farther into the sea but it didn’t take much imagination to understand the desperation of Shackleton’s party trying to find a place they wouldn’t be washed away by storm surge. If we thought we’d had good whale watching in South Georgia, today’s Zodiac cruise with humpbacks and fin whales among icebergs topped the cake. A few humpback whales and six enormous fin whales, the second largest after blue whales and averaging 75 feet long (24m), were feeding a quarter mile away among scattered bergy bits while the ship found position for our landing. It wound up being too windy to set foot ashore but Zodiac cruising was just the ticket, to see a monument complete with bust of Frank Wild, Shackleton’s right-hand man who found the spit where 22 men overwintered waiting for rescue. There was a stiff breeze off the small tidewater glacier faces that made navigation tricky but we had good looks at Chinstrap Penguins nesting on surprisingly inclined faces of seastacks, and of a Pintado Petrel colony on a 100 meter vertical cliff face. 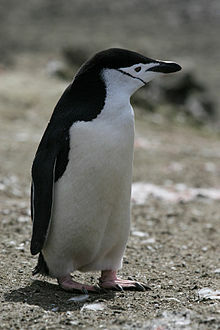 About fifty of the handsome black-and-white checked birds were rafted up preening on the turquoise water below. 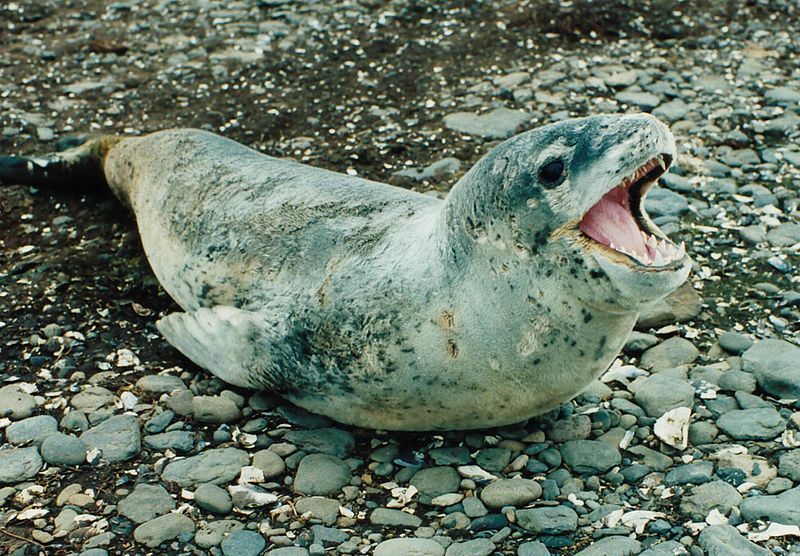 One Zodiac had an extended encounter with a leopard seal on an iceberg. The Zodiacs headed out and see if we could catch up to the whales out beyond the ship. First we chased blows that turned out to be getting farther away until we discovered the main area of feeding activity not far away. Radio communication with staff on the ship helped us locate the cluster of blows. We gathered the boats together so as not to disturb the whales as we approached slowly. Excellent driving by all the boat handlers made it easy for everyone to get good looks in turn as the whales moved back and forth through what must have been a broad swarm of krill below us. After a while of watching from a respectful distance we were amazed when a huge fin whale surfaced a body length away from some of the boats. A mother and calf humpback were especially tolerant of the boats and came up through the middle of the boat cluster, slowly moving along. Then we noticed that two fin whales were surfacing right next to the ship’s gangway, perhaps half a body length from the hull. Amazing! They are usually somewhat shy or at best indifferent to whale watchers. They didn’t stay but the humpbacks were right behind them, and they stayed for a while. Then the calf started throwing its huge tail up in the air and sideways with great splashes. The afternoon light made rainbows in the spray, and the young whale kept up its antics for twenty minutes. The mom disappeared for long stretches, perhaps feeding, while the calf practiced the moves it will use as an adult to communicate with others of its kind. The big surface behaviors like breaching, tail lobbing, and flipper slapping are all seen in courtship and feeding group interactions. A calf might enjoy the play and it’s getting strong and coordinated in the process. This one left us with smiles all around when we reboarded the Ioffe. 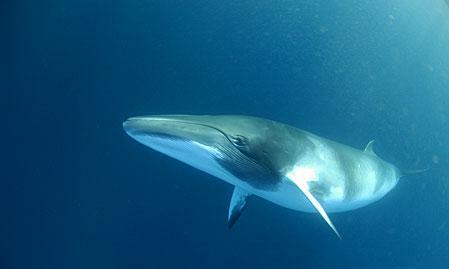 That photograph shows a dwarf minke whale, not a fin whale. Note the robust body, white on the pectoral fin and shoulder, upright dorsal fin, etc. But still an amazing place. These are beautiful animal photos of what must have been a truly amazing experience. Thanks for posting these shots!